The wind out there at sea has finally calmed down and it is time for us to get on. We want to sail up to the northern side of Nordaustland and later around Spitsbergen, so there are still a lot of miles waiting for us. We take some of them today. During the very first mile, we get a very pleasant surprise, a little sensation even, as we see a Bearded seal lying on the beach! 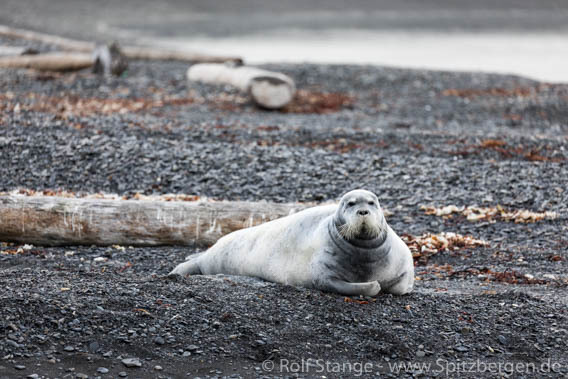 Have you ever seen a Bearded seal lying on the beach? No? Exactly. That does hardly ever happen. Bearded seals lie in the water or on ice and not on the shore. But this one does not seem to know that. 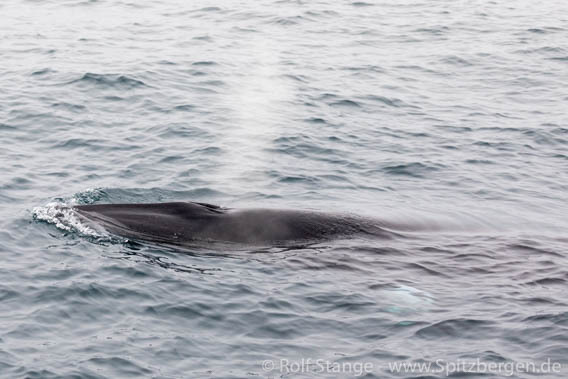 North of Wijdefjord, we meet a similarly unusual Minke whale. Normally, Minke whales do not care much about boats and people and they do not show much more than a short glimpse of their back and fin. But this one does not seem to know that (am I repetitive?). This whale is really curious, it is swimming towards us again and again and diving through under the boat, playing with us! We plough our way to the northeast now, there is some gently swell, calming further down, and the hours and the miles are going by. Not long anymore before we can anchor and go for a walk, somewhere remote.